07/03/19 – Trigger has chosen his favourite applicant and graciously allowed them to take him home. Congratulations to that lucky human! 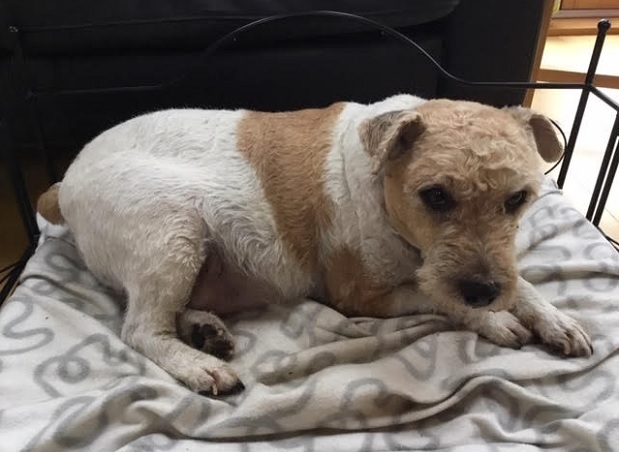 Trigger is a 10 year old Lakeland Terrier x Staffordshire Bull Terrier who came into the Oldies Club rescue because his owner was moving. 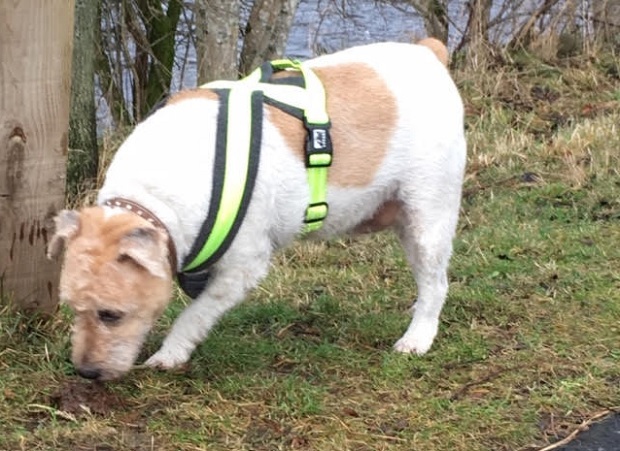 Trigger is in a foster home in Newcastle Upon Tyne, waiting for someone to offer him a permanent home. Overview of Trigger: Since coming into rescue, Trigger has discovered that there is a big wide world out there and he intends to get out and enjoy it. He’s trimming down, getting fit and loving life. He’s good with dogs and children and a very good boy in the home. 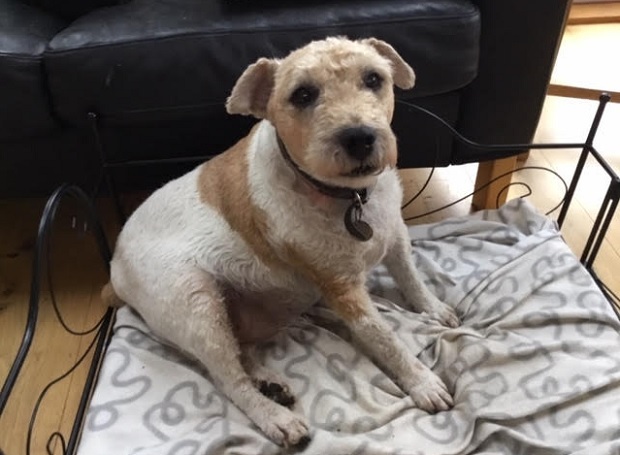 Settled in gradually: Trigger took a few weeks to settle at his foster home, not helped by him being in poor health when he arrived. He has put all that behind him now though, is much healthier and is really enjoying life. Can be left for a few hours: Trigger is 100% clean, dry and trustworthy in the house. He can be left alone, or with another dog, with no noise or problems. However, Trigger is flourishing with a more active routine so he deserves a home where he can be out and about with you, having fun. 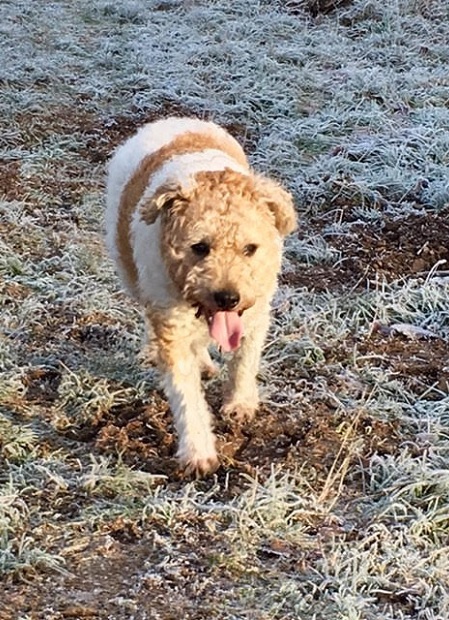 Good with dogs: Trigger is fine with other dogs both in the house and outside, and has visited friends of his fosterer where there are dogs. He sometimes approaches dogs to say hello, and he might play but is not over interested. He is friendly and placid with dogs, but not a pushover – they can’t have his chew! Unknown with cats: Trigger hasn’t met cats in foster, but his foster carer could cat test him if necessary. Good with children: Trigger lived with children previously and is very tolerant of them. He would be OK to live with kind children aged 5 years and above. 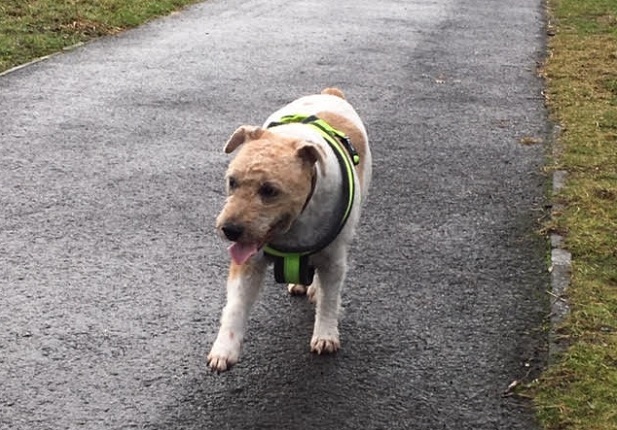 Loves walks: Trigger walks nicely on the lead, though he does sometimes get fixated on something and either stop or veer towards it. It’s important not to pull Trigger by the neck, as he previously had a neck problem, so he must be walked on a harness. He is very easy to walk off-lead, as he either walks next to you, or stops to sniff something and then catches up. He is currently having about 45 minutes off-lead walking per day and he loves it. He needs to continue to build up his level of activity slowly. There is a much fitter and happier dog just waiting to happen! Excellent in the car: Trigger travels in a crate in the car and settles immediately with no noise. He really likes a trip out. He needs lifting in and out of the car. Trigger’s favourite pastimes: He loves walks and enjoys thoroughly sniffing the ground. He likes to play with a toy and then lie on top of it (just in case it tries to escape!). He really loves a chew, and he likes his ears or the side of his head rubbing. Trigger’s dislikes: He doesn’t like the vets. It’s best to wait outside for his appointment and then go straight in, as he gets nervous in the waiting room. He gets startled if there is a loud bang like a door slamming in another part of the house. He barks at the doorbell. Health notes: Trigger is neutered, vaccinated, microchipped, and has been wormed and flea treated. He arrived with a neck injury and was very overweight. He made a fantastic recovery, but his weight and fitness are long-term projects. He is currently on a painkiller and is likely to need this until his fitness has improved, but he shouldn’t need it forever. 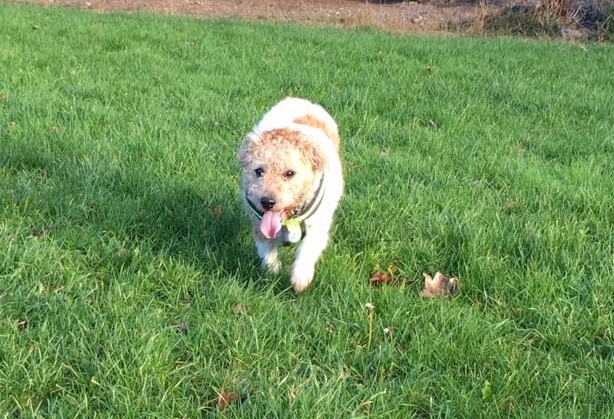 More from Trigger’s foster carer: Trigger is calm, friendly, gentle and playful. He has been a lovely house guest. He sleeps all night and doesn’t mind a lie in. He is very quiet, relaxed and happy in the house. He doesn’t attempt to get on furniture. He manages steps and stairs OK, though it’s not very elegant. Trigger has a thick wiry coat and will need this clipped 2 or 3 times a year, otherwise he begins to resemble a sheep and gets too hot. He is a lovely lad with no behavioural issues at all. He now needs someone to help him become the fit and active dog he should be. 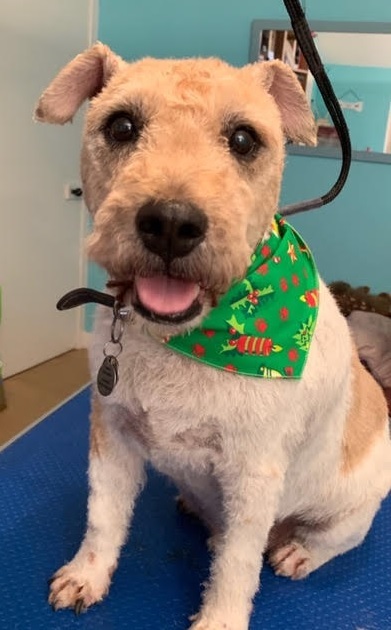 Trigger can be rehomed anywhere on the UK mainland, subject to a satisfactory home visit, but note that you will be required to travel to the foster home to meet him.